Submitted by: Keurig Green Mountain, Inc.
WATERBURY, V.T., Feb. 19 /CSRwire/ - Today Keurig Green Mountain, Inc. (Keurig) (NASDAQ: GMCR), a leader in specialty coffee, coffee makers, teas, and other beverages, launched its tenth annual Sustainability Report. The report focuses on Keurig’s efforts to strengthen its global corporate citizenship and sustainability leadership, highlighting recent sustainability initiatives, progress against the Company’s 2020 sustainability targets, and a new water stewardship target. The report underscores accomplishments and opportunities within Keurig’s sustainability practice areas, with a particular focus on water stewardship, supply chain resiliency, and sustainable products – especially K-Cup® recyclability. Keurig is collaborating with the recycling community and its partners to ensure that K-Cup® packs aren’t just recyclable in theory, but can also be effectively recycled in the majority of communities. This includes supporting efforts to expand the recycling infrastructure so more materials can be conveniently recycled in more locations. n 2014, Keurig committed to investing $5 million over five years in recycling solutions via the Closed Loop Fund, a coalition of companies that are providing essential investments required to meet some of the larger challenges to recycling access in the United States. Access to and availability of water is critical throughout Keurig’s value chain and is intertwined with other global challenges such as climate change and the need to feed a growing population. Within this complexity, Keurig is addressing water stewardship opportunities with a new 2020 target and by engaging its network of partners and consumers to expand the impact of its efforts. The Company’s new 2020 water stewardship target is to balance, ounce for ounce, the water used in all of Keurig’s beverages. For every cup consumers brew, Keurig’s target is to restore the same amount of water for natural and community uses. Keurig is developing quantifiable projects, with an emphasis on those that build or promote natural water management infrastructure, provide source water protection, and restore river and streambank zones and urban waters. Keurig’s approach to water stewardship aims to be both responsive and restorative. Keurig intends to optimize resources through efficient use of water in our own operations; balance the water used in all our beverages through projects that restore an equal volume of water; and connect people to clean water sources. Keurig’s responsible sourcing and supply chain outreach programs aim to provide its suppliers, their employees, and their communities with the skills and tools to build a foundation of resilience that will help improve their business practices and employees’ livelihoods while ensuring a long-term, sustainable supply of high-quality products and ingredients. Keurig has also committed to source 100% of primary agricultural and manufactured products by 2020 according to its established responsible sourcing guidelines. In fiscal year 2014, Keurig released updated guidelines to suppliers that reinforce the Company’s efforts to help suppliers meet its high standards for quality, safety, and social and environmental responsibility. Knowing where products originate is the first step towards responsible sourcing and 64% of the Company’s coffee was traceable to source in fiscal year 2014. 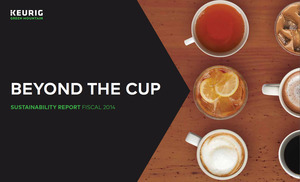 Full details of Keurig’s 2014 Sustainability Report can be found at http://www.KeurigGreenMountain.com/Sustainability/Overview.aspx. Sandy Yusen Keurig Green Mountain, Inc.